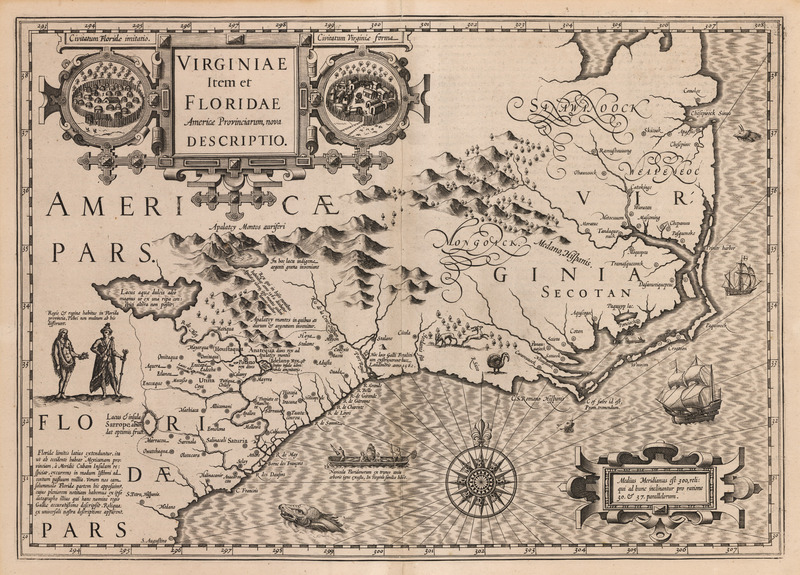 Home > U.S. East > 1606 Virginiae Item et Floridae Americae Provinciarum, nova Descriptio. This map is one of the most important maps of this part of the New World of its time, one which continued to be important and exert influence well into the eighteenth century. It is the most influential map of Southeastern North America in the 17th century, and the first to depict Virginia and Florida. Hondius’ map covers an area from the Spanish colony of St. Augustine to the north, past the Outer Bank of the Carolinas all the way to Chesapeake Bay. It is a synthesis of two maps of the previous century, the Le Moyne of Florida and the White map of Virginia and Carolina, both published by Theodore de Bry. Though the map contains a number of errors, its influence was significant. One obvious error is the jutting horizontal projection which places Carolina and the Outer Banks too far to the east. The error occurred in earlier maps and is related to difficulties experiences by mariners in the 16th century in calculating longitude and accounting for magnetic variance. The distortion may well have been problematic for sailors running short on supplies following a trans-Atlantic crossing had they chosen to land there rather than in the West Indies where most first stopped. When the marine chronometer was invented in 1714 it finally made possible accurate measurements at sea. While famous for its geographical contributions, the map is also noted for its beauty and charm. It is generously illustrated with various decorative elements drawn from early encounters with American indigenous peoples. Adding to the interest of the map are two large frigates and a canoe filled with natives. Sea monsters frolicking in the sea further embellish the map, and the cartouches are works of art in themselves. Inland we see a variety of wildlife, and a ‘queen’ and ‘king’ of indigenous peoples of Florida. The lovely title cartouche is set between scenes of Indian settlements which stand behind high, fortified defensive wooden walls. A charming baroque cartouche in the lower right quadrant defines the setting of the decorative compass rose. Condition: This important map is in B condition. A strong impression on heavy paper, it has a slightly rolled centerfold and browning around the edge but not touching the image, caused by previous matting.